Seven years ago, Alexander Schey stood at the coastline of the southernmost city on the planet, not sure where to go next. It’s not that Schey lacked talent, intelligence, or motivation—far from it. He’d just completed the 19,000-mile Pan-American Highway with his friend Toby Schulz in a custom electric vehicle (EV) of their own design. After securing funding for the project, Schey left the mechanical engineering program at Imperial College London; converted a Radical SR8 race car to an EV, with the help of a postgraduate team of engineers; and made the months-long drive from northern Alaska to Ushuaia, Argentina, simply so people could see what an electric car could do. 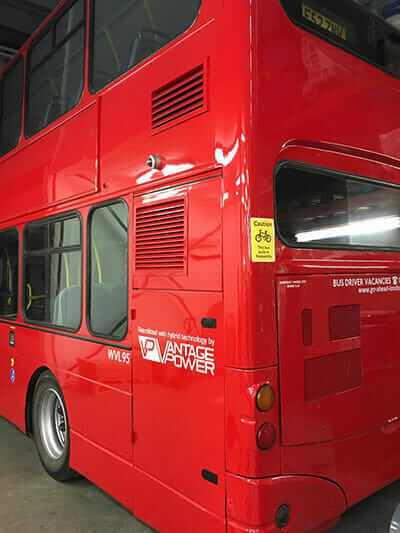 One of London’s 9,250 buses—this one retrofitted by Vantage Power. Courtesy Vantage Power. After loads of press and an eight-part BBC documentary about the epic road trip, Schey and Schulz found themselves back in London at the start of 2011—just two guys in a house with no money aiming to start a business. They needed a niche within automotive electrification that made sense for a startup to approach. After noticing the world’s looming diesel-bus problem, the two cofounded Vantage Power to create hybrid-electric retrofit system for buses. There are more than 46,000 buses in the UK using more than 1 billion liters (264 million gallons) of diesel fuel a year. 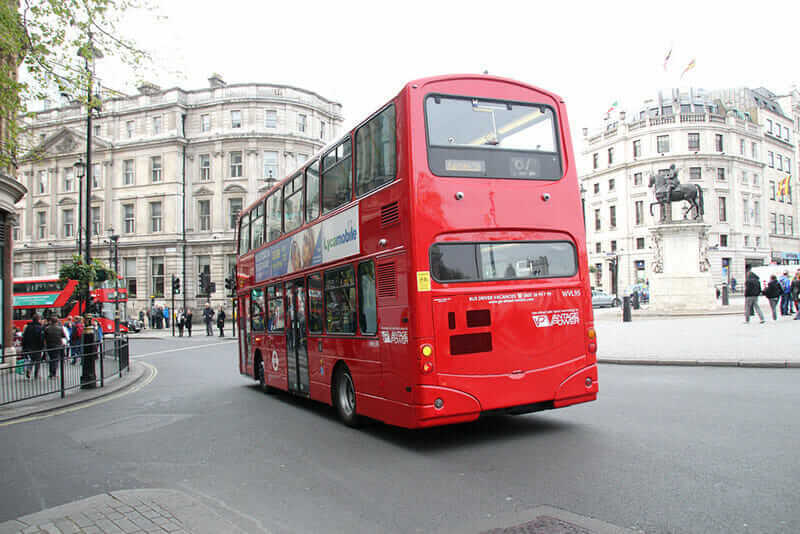 London itself has 9,250 buses, and beginning on April 8, 2019, diesel buses will pay a substantial fee to drive through the new Ultra Low Emission Zone in central London. Hybrid buses can escape the fee, but those buses also hit operators with huge upfront costs. With Vantage Power’s B320 Hybrid Retrofit System, a company can turn its existing buses to hybrids with zero net cost. 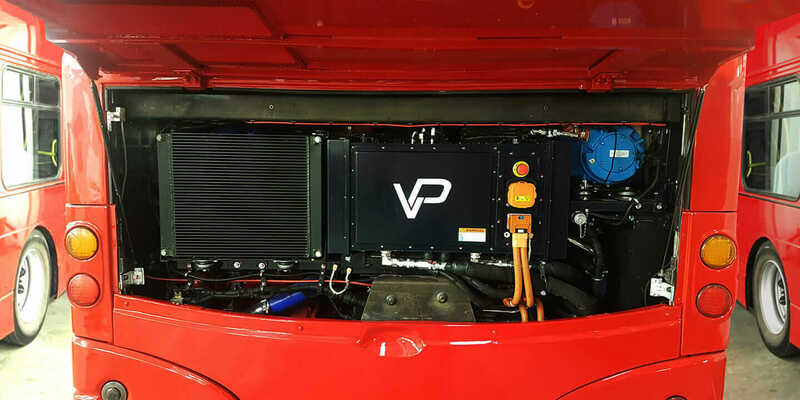 Vantage Power’s B320 Hybrid Retrofit System. Courtesy Vantage Power. Of course, Schulz and Schey persuaded hearts and minds about EVs with their Pan-American trip, they have to show the mettle of their product. But when your product is a 1.5-ton hybrid engine system, it’s more than a little complicated to demo. Enter the Microsoft HoloLens. This mixed-reality headset incorporates 3D holograms and spatial sound with a user’s real-world environment. With it, Vantage Power can show life-size 3D models of its engine, battery pack, and entire hybrid system to prospective customers. Although the HoloLens is still only available in expensive Development Editions, Schey first tried it in 2015 and immediately realized it could help his company. 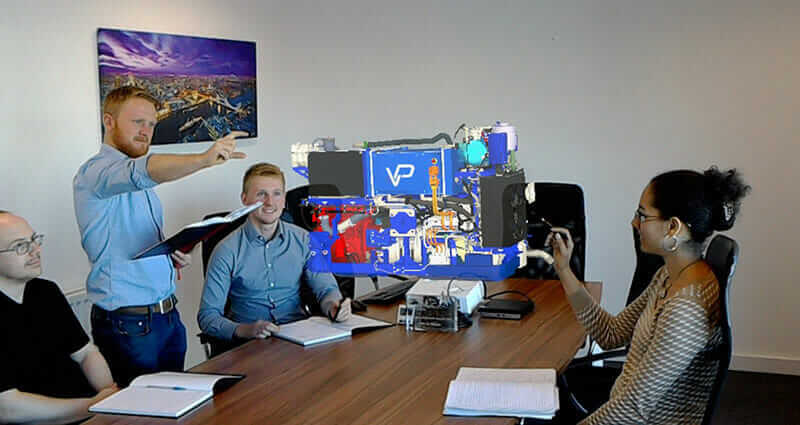 When Vantage Power finally got a hold of one earlier this year, it took Schey and his team quite a bit of work—and some help from London 3D augmented-reality company Gamar—to transfer their huge 3D models in Autodesk Inventor to the HoloLens. “It needed to be stripped back quite a lot—removing internal features and smoothing out curves and reducing polygon count—so the processing power of the HoloLens could handle it,” Schey says. It proved to be worth the effort. Since Schey started showing his Vantage Power HoloLens demos in July, he’s put the headset on just about everyone: customers, investors, employees—even his 85-year-old grandfather. 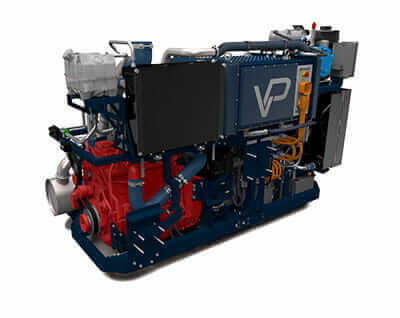 Vantage Power’s hybrid powertrain reduces fuel consumption and emissions by more than 40 percent. Courtesy Vantage Power. Vantage Power has only scratched the surface of what it can do with the HoloLens in its business. Schey has a goal of incorporating the device into vehicle maintenance. Mechanics armed with a HoloLens could go out to vehicles they’ve never seen before while people at the home office would see the mechanics’ point of view from the headset’s camera. They could pull up manuals to show the mechanics, who would see them while their hands were free to work. They could make repairs faster and with less upfront training. Demonstrating a 1.5-ton hybrid engine system is much easier with Microsoft’s HoloLens. Courtesy Vantage Power.